Email Testing: What works (and what doesn’t) when deciding on fundraising ask amounts? We’ve always used the ActBlue blog as a place to report back on our work and let everyone who’s part of the larger ActBlue community know about the huge impact their organizing work and their donations have on the progressive movement. Primarily, that means sharing stats and insights into the donations that run through our platform. But as a nonprofit, we also put a lot of resources into running our own email fundraising program, just like so many of the groups using ActBlue to fundraise. And we use our tools to do it! During this election season, which is already proving to be busier than ever, we want to provide everyone using ActBlue with as much info and data to help guide your strategies as possible. That’s why we’re sharing two tests on the way we generate ask amounts for our ActBlue fundraising emails (and why we plan to keep sharing relevant test results throughout this year). If you have questions or thoughts on these tests, feel free to comment on this post. We hope this gets the gears turning in terms of some new tests for the other fundraising programs out there! For our email fundraising, we have been re-evaluating how we use a donor’s previous contribution history to tailor the ask amounts we use in emails. 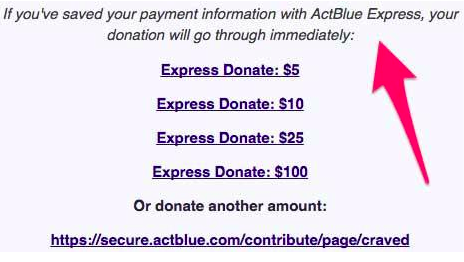 We use ActBlue Express Lane for all of our fundraising emails, which allows ActBlue Express users to give simply by clicking a button in an email. Over the years, we’ve optimized the number of ask amounts we include in an email, as well as considered the range and distribution of the amounts we include. We’ve also tested different sets of ask amounts for donors who tend to give different amounts. For example, the buttons for a donor who tends to give $30 once a year will be tailored to that amount and different than those a donor who regularly gives us $3 contributions will see. To determine those asks, we typically look at our donors’ previous contribution history and use their highest previous contribution amount (HPC) to determine which set of ask amounts to use. 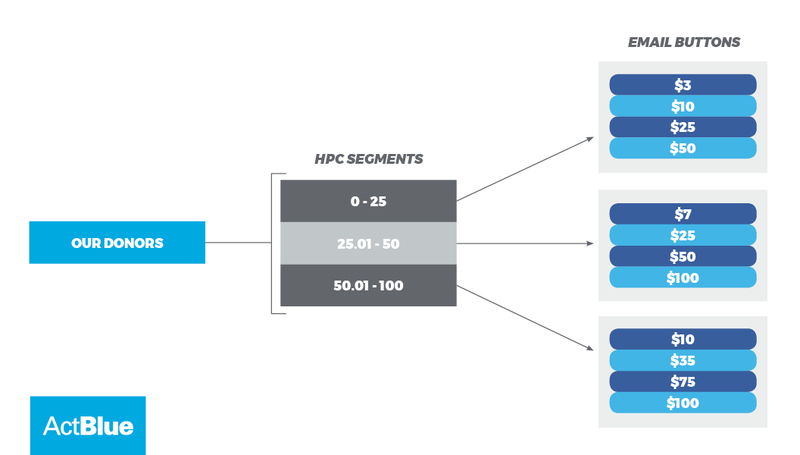 If a donor’s HPC was below $25, they would be grouped into a segment of donors that would see the first set of buttons (top) in the image below, whereas if their HPC was between $25 and $50, they would be in the group of donors that saw the middle set of ask amounts. We fine-tuned these default ask amounts for each group of HPC amounts over many email tests until we saw the gains in our conversion rates plateau. This made us wonder if the conversion rate we had reached based on testing HPC amounts was the highest rate we could achieve, or whether we could reach a higher peak by starting with a different premise. With about six months left in the election cycle, we’ve been focused on maximizing recurring sign-ups rather than one-time contributions, so we started to think about alternatives to HPC that were better tailored towards action rates and recurring signups. First we tested average previous contributions (APC) for donors who have given more than one contribution. Our hypothesis was that a donor would be more likely to take action when given ask amounts tailored towards the average of their previous contributions rather than their highest contribution amount. 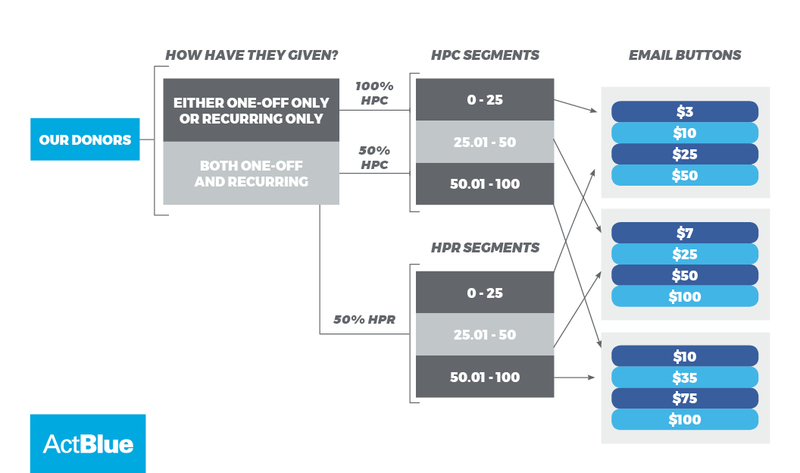 We tested this hypothesis by splitting our donors and assigning half of them ask amounts based on their HPC and half based on their APC. We used the same ask amounts we typically use with both of these newly sorted groups. For our list, this proved to be an effective method — we increased the action rate by 20% and the total amount raised by over 4%. We successfully raised more money by getting more contributors to give smaller amounts! The increase in our action rate indicates our ask amounts based on HPC may have been too high. Donors may be inspired by your ask but not always able to match their own highest contribution. By lowering our ask amounts, we kept more donors engaged and decreased the likelihood they would be alienated by receiving ask amounts greater than their ability or willingness to contribute, while still raising more overall. From this experiment, we’ve continued to build on our results. We are now working on optimizing ask amounts based on our donors’ APC amount and also tested ask amounts based on the type of contribution a donor has given previously. After all, if your goal is to maximize recurring signups, why ask for the highest previous contribution when that is likely to reflect a one-time contribution rather than a recurring amount? It’s also in line with what we know about small-dollar online giving — people want to give when they’re moved to support your cause, and that is often at a lower level multiple times throughout a cycle. That’s a useful lesson for smaller campaigns and organizations who don’t have the list size to run an involved test like this. To improve recurring signups, we designed a test that was a bit more complex. We took all of our donors and first split them into three groups: those who had only given one kind of contribution (one-off or recurring) and those who had given both kinds of contributions. We then took the group of donors who had given both kinds of contributions and split them in two again: half were assigned ask amounts based on their HPC and half received amounts based on their highest previous recurring contribution (HPR). The impact? We raised nearly twice as much from donors in the HPR group than those in the HPC group. We found that donors were far more likely to give recurring contributions with ask amounts tailored specifically to their recurring contribution amounts. The results of these tests reinforced a few things: First, how critical it is to question our basic assumptions about email practices to continue to build on our results. And second, how important it is to think about the kind of program you want to build. Do you really want to maximize a person’s donation once? Or are you more worried about building a robust, sustainable recurring program? Is your campaign in the news a lot, and therefore do you have lots of opportunities to engage people who have already donated? All these factors should play into how you think about your ask amounts. If you’re an admin at a campaign or organization, you can conduct these tests too! We recommend starting by setting up a webhook to collect and analyze more information on your group’s contribution history. If you’re running a smaller campaign and building your list, you may not have enough data yet to test based on your donors’ contribution history. If that’s the case, we recommend using our Smart Recurring tool to ask one-time donors to add a smaller recurring contribution. This will help you build a robust, small-dollar program and provide more insight into how your donors respond to different ask amounts! If you have any thoughts or questions about setting up a test like this, please reach out to stern@actblue.com!